OK, so what's a GoGirl? Simply put, GoGirl is the way to stand up to crowded, disgusting, distant or non-existent bathrooms. It’s a female urination device (sometimes called a FUD) that allows you to urinate while standing up. It’s neat. It’s discreet. It’s hygienic. GoGirl is easy to use. Just hold GoGirl against your body, forming a seal. Aim and, well, pee. Pretty simple, huh? GoGirl fits easily in your purse, pocket, or glove compartment. It’s a must for travel and sports. And it’s great for everyday – no more crouching over or trying to cover up an unsanitary public toilet. While the concept may be new to you, European women have used female urination devices for years. GoGirl’s not the first device of its kind. But try it. And we think you’ll agree it’s easily the best. Only GoGirl is made with flexible, medical grade silicone. Dispose of it after use. Or clean and reuse as you like. (Urine is sterile, but the product can come into contact with contaminates during use, so take precautions when cleaning.) Our patented splash guard eliminates messing and spilling. Once you practice a time or two, using GoGirl is going to feel like second nature. 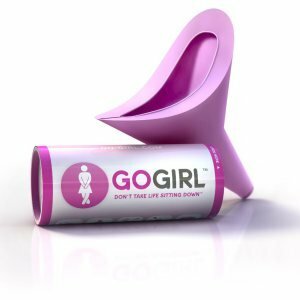 GoGirl is easy to use, but standing to go to the bathroom is a new concept for most women. Here are a couple of tips to help you use GoGirl effectively. I suggest trying GoGirl at home, in the shower if possible, to master your technique. With a little practice you can simply unzip your fly and go to the bathroom without having to remove your pants. The best way to hold GoGirl is by using your thumb and middle finger, stretching from front to back. Because it’s made of a medical-grade silicone, it’s flexible and works with any body shape. Maintaining a seal on the back-end is key. It’s best not to hold GoGirl from side-to-side. Try it a few times at home to master your technique so you’ll know what to expect and feel more confident when you need GoGirl on the go. Don’t get discouraged if you dribble the first time or two. With a little practice GoGirl will work perfectly every time. Because GoGirl is reusable, it’s environmentally smart. Our active lifestyle girls are our most loyal customers and they love that it’s reusable. The medical-grade silicone is so tough it can withstand boiling water and remains supple. It’s easy to re-use your GoGirl. Wash with soap and water, and dry. The medical-grade silicone dries quickly and you can shake it lightly to help dry. – Slide back into your tube for the next use. Roll it up with a fresh tissue, place it in the baggie provided , and put it back in the tube for many uses. It works best to fold the baggie.